At a recent Danskin Tri expo I overheard a man say that he uses a Skeese Greets card image as his screen saver. I was kind of surprised by this, yet flattered at the same time. I wondered how he obtained the image so that it actually looked good on the screen. Nevertheless, it gave me the idea to create some free screen savers. 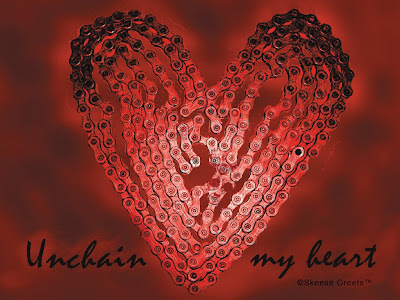 This "Unchained Heart" design was the first bicycle chain greeting card I created. So here it is as the first of several soon-to-be released screen savers. Right now it's only available as a full screen image at 1024x768. How to install: Click on it, then right click & "Set as Desktop Background." I hope it works for you & I really hope you like it!